If you are in need of an accredited method for calibration of pipettes (compliant with the ISO 8655 standard), preventive maintenance, repairs with the use of original spare parts or just a routine check-up, you can count on our experience, supported by certificates of training. Here you can fill out a form for your pipettes (repair/calibration). 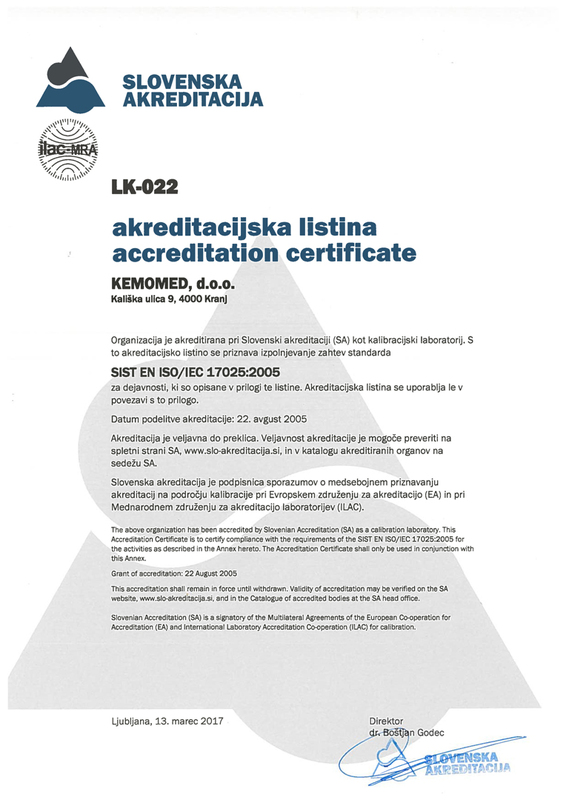 Kemomed’s calibration laboratory is accredited at the Slovenian Accreditation, reg. number LK-022, SIST EN ISO/IEC 17025. SIST EN ISO/IEC 17025 (paragraph 5.10.4.3) states: When and if the instrument for calibration is calibrated and repaired, a report must be filled out showing the results before and after the calibration, if these results are available. We collaborate with the international franchise PipetteDoctor that not only supplies us with spare parts, but also provides specialised technical training. We offer servicing and spare parts availability for the following manufacturers: Biohit, Brand, CAPP, Corning, Eppendorf, Thermo (Finnpipette), Gilson, Rainin, and Socorex. If possible, we tend to pick up and deliver the pipettes personally. We guarantee the shortest possible response time from your call to the end of our repairs. Along with every calibration of pipettes we also perform its maintenance – disinfection, cleaning of the inner and outer parts, lubrication, changing the filters and seals.